This in the Ria de Pontevedra and Vigo Sanjenjo north to south. --The PRICES SHOWN ARE FOR OCCUPANCY --Completely - HOUSE FOR TWO PEOPLE, EVERY PERSON MOST SUITABLE added to the price + 10euros / day. Discount for stay except July and August, other months are discounted by 10% for a week, 15% for two weeks, and 20% for a month or more. Bueu is a tourist and fishing town of 14,000 inhabitants, situated on the coast of PENINSULA OF MORRAZO, has 20 beaches, and is linked to other coastal towns of Morrazo, adding including a total of more than 50 beaches and coves in the Peninsula of morrazo. The house is ideally situated in very quiet area. Place of great peace and quiet, despite being next to all city services. It has a alrrededor enclosed terrace with direct access to a large over 5000metros / 2, in the center of which is a chalet, where the owner lives, and therefore will always have the help they need., Privately wealthy enjoy the house and its closed environment, and shared with the owners garden. It is at the heart of the RIAS Sanjenjo just north across the Ria Vigo and south. There are tourist boat trips on the rias. and ONS islands. They can BUEU MORE INFORMATION AND ITS ENVIRONMENT, VISITING THE SITE. The new villa has wonderful panoramic views on Bueu and Beluso. It is situated in a gardened area close to the historic manor of Santa Cruz de quitapesares (17th century). 2 bedrooms from Which one is double and the other single. There are sofas Which one can be used as beds and one bathroom. Situation: 17 km from Pontevedra, 17 km to Vigo, 28 km to Sanxenxo, 350 m to the beach, 17 km to the railway station, 24 km to the airport, 350 m to the center of town, 350 m to the doctor, 17 km to the hospital, 350 m to the supermarket. There is a new highway Which will take you to Vigo in 10 minutes. Activities in the Neighbourhood: Restaurants, cafes and bars, nightlife, casino, marina, water sports, tennis, hunting, fishing, horsebackriding, golf, panoramic views, walks in the nature, shops, museums, natural park. W. C. and centralized hot water. La casa es una de las más acogedoras en las que hemos estado con unas vistas maravillosas que superan incluso a las fotos. La limpieza de la casa excepcional y no le faltaba detalle. Carlos y su familia han sido muy hospitalarios pendientes en todo momento de que no nos faltara de nada. Gracias Carlos repetiremos sin dudarlo! El verano pasado (2016) pasamos 15 días de vacaciones en esta casa. Tanto nos gustó que reservamos para este verano, pero, desgraciadamente, un problema familiar nos impide hacerlo. La comprensión y amabilidad de Carlos y Merche sólo cabe calificarla de extraordinaria; como exquisito fue todo el trato que recibimos de ellos durante nuestras vacaciones. Recomendamos, encarecidamente, esta casa: el lugar perfecto para conocer una tierra maravillosa. Los atardeceres en su porche... un recuerdo inolvidable. La maison est comme elle apparaît sur les photos, bien située mais elle est dans un grand jardin avec 2 autres logements de vacances et la maison du propriétaire qui veille. Notre séjour a été gaché par les aboiements de chiens, tant de jour que de nuit. Y compris le chien du propriétaire très gros mais très gentil. La literie est abominable de qualité et les sommiers ne correspondent pas à la taille des matelas. 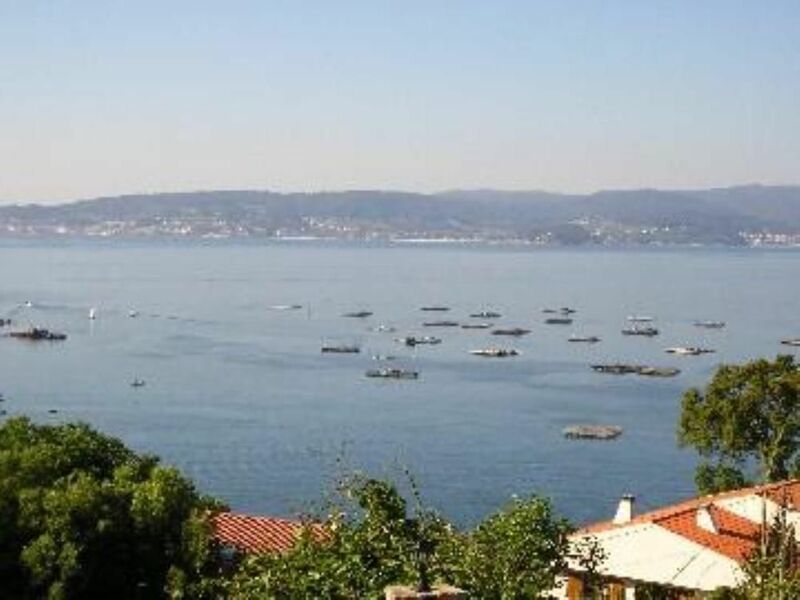 The coastal village of Bueu is situated 15 kilomtres of 20 kilometers of Pontevedra and Vigo. Several of These small islands form the national, maritim, terrestral park of Atlantic Islands. You wont be disappointed visiting them. The combination of the Atlantic islands of Galicia are FORMED by four archepilagos: Cies Islands, the islands Ons and Onza, Sálvora island, island of Cortegada and Malveires. This wonderful part of Galicia was of declared as a national park in 2002, but only six months after That, the disaster of the Prestige destroyed big part of vegetation of These beautiful islands. They are now in full recovery phase, but dont know ecologist When They Will Be Completely healed from the 'black disaster'. the church of Santa María de Beluso from the XII century, however it fully restored after a storm at the end of the nineteenth century. The Rhodes beach, was nomined in 2007 The Best Beach of the World for the UNESCO. tarifas decrecientes en función de la duración, tarifa en función del número de personas, fianza pedida, arras/deposito de reserva, entrega y recogida de llaves realizada por propietario.